This time of year, when we are firmly in winter’s grasp and spring seems so very far away, it can be nice to serve a little sunshine on your table. 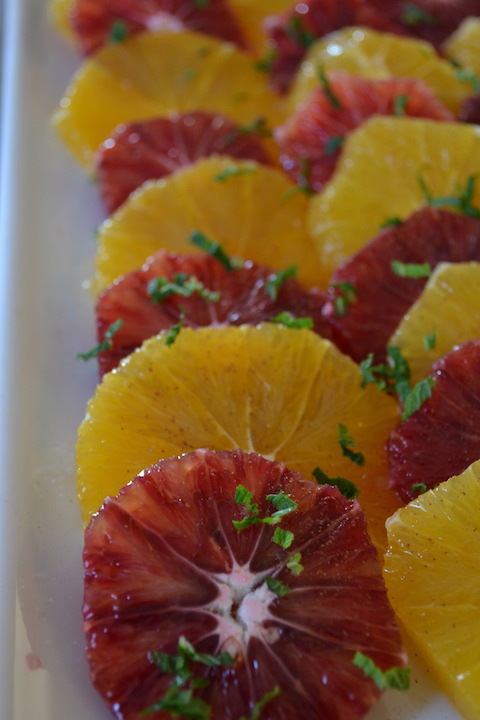 This salad rises to the occasion nicely with a combination of bright blood oranges and navel oranges. In both looks and taste, the citrus zing that this salad provides will not only brighten even the dreariest winter day, but also serves as an ideal counterpoint to the often heavy dishes of winter. Several years ago, my husband gave me Paula Wolfert’s cookbook The Food Of Morocco and I’ve been entranced by the cuisine ever since. Morocco’s on my bucket list and the chance to spend time wandering through a Moroccan market shopping for spices is high on my list of culinary must-dos. It’s hard for me to pinpoint why I’m so enchanted by Moroccan cuisine. Perhaps it’s the many spices, like saffron, cardamom, turmeric, ginger, allspice, fenugreek and nigella seeds that are ground to make spice mixtures redolent of the desert. Maybe it’s the alluring fragrance of rose and orange water, used in cooking, but also dabbled on the wrist and behind the ear by diners as a perfume following a meal. To me, everything about the cuisine is exotic including the tagine, a cooking vessel used extensively in Moroccan cooking that embodies the sensual yet earthy nature of Moroccan food. The distinct pots with their conical tops seem homely until a sultry trail of steam, smelling of far-flung places, whispers out the top. This orange salad is one of the simplest examples of Moroccan cuisine, but don’t mistake its straightforwardness for a lack of complexity. Sprinkled with cinnamon and then drizzled with orange water, its seductive taste may get you hooked on Moroccan food. Orange water, for those unacquainted with its aromatic bouquet, stops many in their tracks and I recommend applying it with restraint at first. Less is more as you don’t want your salad to smell as though its wearing perfume, but rather to give off a faint whiff of orange blossoms. As with any simple dish, obtaining the best ingredients and assembling them with self-restraint is the trick to this salad’s success. 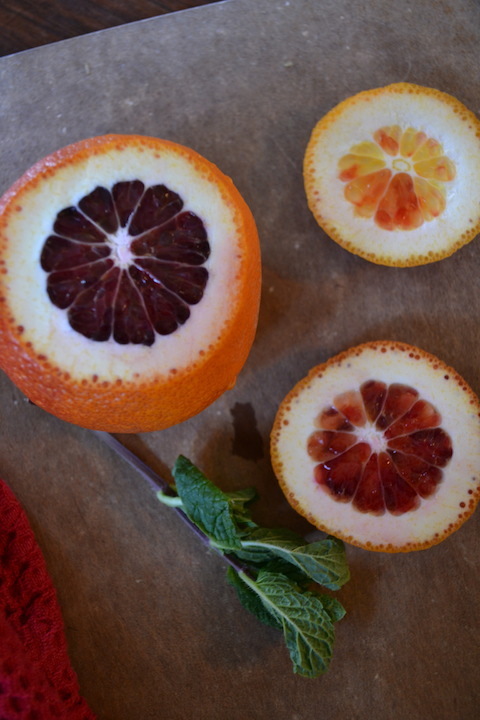 While navel oranges can be used in place of the blood oranges, I urge you to seek out blood oranges for the color they bring to the dish as well as the additional tang they add. The scattering of mint as a final garnish adds a bit more color and in my opinion, completes the salad. Happy cooking! Serve this salad with a bowl of steaming harira for a traditional Moroccan dinner. 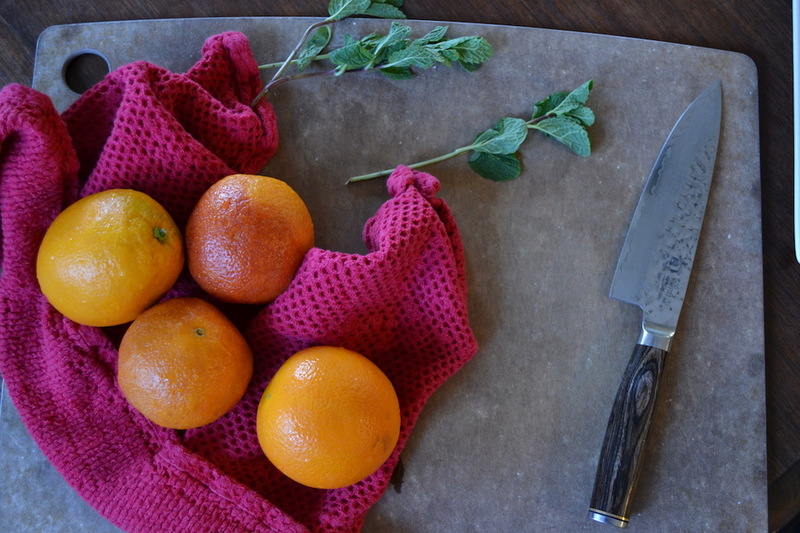 Cut the peel from the navel and blood oranges and discard. Slice the orange crosswise into ¼-inch slices. 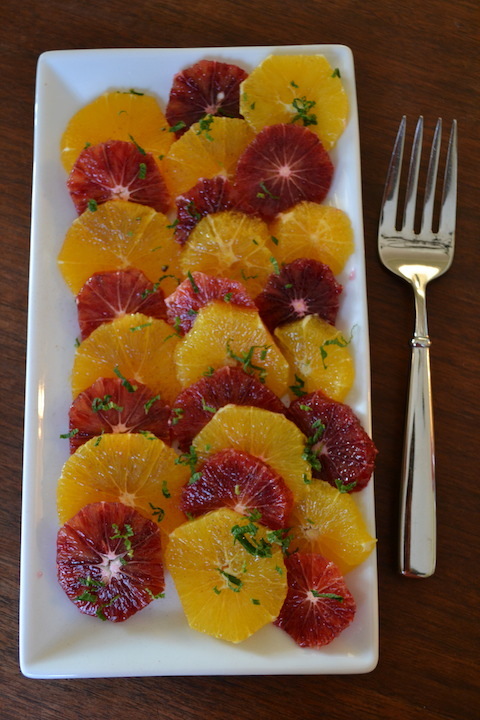 Assemble, alternating the different types of oranges slices decoratively, on a serving platter. Drizzle orange water (with restraint) over the oranges. Sprinkle with ground cinnamon and the mint leaves. Serve chilled or at room temperature.